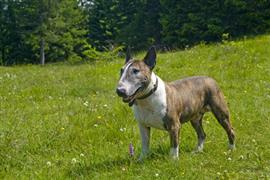 Bull Terrier owners have many name options based simply off the distinct appearance and physique of the breed. The Bull Terrier is very stout and has immense power for a dog its size. Names like Torque, Dynamite, and Rocky are common selections that emphasize strength. When stout isn’t busy meaning bulky, it’s hanging out at the bar. Rogue and Guinness are a few names borrowed from favorite stout beers. The Bull Terrier has a unique appearance that starts with an egg-shaped head. Some egg-inspired names include Humpty, Poultry, Yolk, and Scramble. As a compliment to its unique head shape, the Bull Terrier’s eyes are triangular in appearance. Some cool ideas that come from classifications of triangles include Scalene, Isosceles, Acute, and Obtuse. While these names are loosely inspired by typical physical characteristics of the breed, owners often draw inspiration from a variety of other places. Children in particular are known to come up with unique and arguably some of the best names out there. Disney characters like Aladdin, Simba, and Tigger are all top childhood selections. Some of our pages will contain a subcategory. A subcategory is a slightly more specific grouping than the main topic of the page. For a subcategory, we will include a separated table of names and corresponding descriptions. An example of a subcategory of Red Dog Names would be 'Dog Names Inspired by Red Wines'. If you have any subcategory ideas for the Bull Terrier Names page, we would love to hear them. Use the form below to submit your ideas.